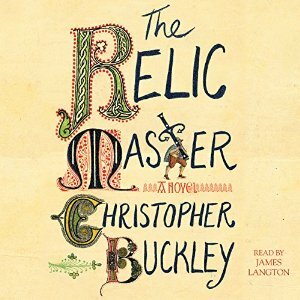 This latest yarn by Christopher Buckley is a fun exercise in historical fiction. The shroud of Turin was venerated for centuries as the burial cloth of Jesus. In 1988, carbon dating showed it to date back only to the mid-thirteenth to late fourteenth century date range. This tale begins with news of a discovery of a similar shroud in the crypt of Pope Leo X in 2017. The drama of The Relic Master does not derive from the question of whether or not it is authentic (like the shroud of Turin, it is a fraud) but rather from the events surrounding its creation in the sixteenth century. This is a tale of adventure in a Europe suffused with religion and on the verge of the Reformation. (Martin Luther is an important off-stage figure.) The credulity of so many with regard to relics is balanced by sincerity of many and (until a certain crisis) the honesty of the relic master, Dismas, who seeks out relics for both Albrecht, Archbishop of Mainz and Fredrick III, ruler of Saxony who, in Mr. Buckley’s telling, is a man of notable humanity and shrewdness. The great artist Albrecht Durer is a friend of Dismas and an important character. Mr. Buckley seems to smile at the religiosity of the era while also respecting it to some degree. This fluently written tale with strong characterizations and a lot of humor is an entertaining read.